Download SD card formatter V5 and repair corrupted memory online .SD Formatter can format write - potected memory cards .SD Card format tool support MMC and Micro SD cards . 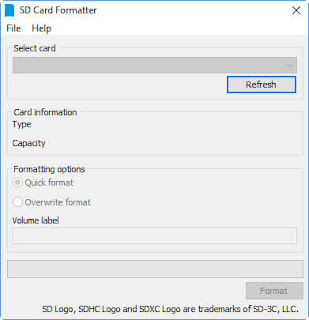 SD Association Company has released a new version of SD Memory Card Formatter called SD Card format tool V5 .The new memory card format tool can format Micro SD Card, SDHC Memory Card and SDXC Memory Card .SD format tool V5 perform a quick format for your corrupted SD card. SD Card Formatter online V5 support formatting Panasonic SD Memory cards .The new version support both Windows(Windows 2000, Windows XP, Windows Vista ,Windows 7,Windows 8.1 ,Windows 10 ) and MAC operation system .